Ely MN--On June 21, 2009, Rick Metz, Harry Seldby, Travis Metz, and Scott Sandholm journeyed to Ely to tackle six days of wilderness canoeing in Minnesota’ Boundary Waters Canoe Area. 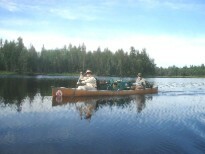 The four used Canadian Border Outfitters and rented Kevlar Minnesota II canoes. After spending the night at the outfitter’s lodge the group shuttled to Lake One. It was a busy place since thirty parties are allowed to launch at Lake One daily. There were two short portages over good trails from Lake One to Lake Two, the lakes being separated by another small lake. They continued into Lakes Three and Four without having to portage. The navigation is not trivial but Harry and Scott found the route. The men chose a campsite on Lake Four. It’s open space discouraged the mosquitoes but the kitchen was close to the woods so the bugs had to be fought while cooking. The latrine was deep into the woods and using it required spraying up with bug spray before dropping drawers. Scott and Travis did a great job rigging the food packs bearproof by hanging them in trees. Travis slept in a hammock and the other three used individual tents, although Travis stayed in Rick’s tent the first night because of rain. This was the base camp for all five nights. Each day started with breakfast followed by in the late morning, followed by lunch on the shore and then a nap, more fishing, and a return to camp for supper. Supper usually was wrapped up by about dark. The mosquitoes swarm after dark so there were no campfires built. Everyone just sought shelter. T he four caught enough fish for three dinners, including some nice two and three pound smallmouths and some walleyes and pike. Travis used a large Rebel jointed minnow that worked very well. Jigs, beetelspins with a leech, and shallow-running minnow plugs all brought in some fish. Rick and Travis had some angler’s luck with a topwater plug with a topwater concave face that would pop when jerked. The big three of Boundary Waters wildlife (wolf, moose, and bear) were not seen but some deer, rabbits, squirrels, bald eagles, and beaver were. A huge snapping turtle follwed a fishing lure into shore. Dragonflies were hatching in the campsite. A rather ugly looking bug would crawl out of the shelter onto the rocky shoreline. In a process that took a couple of hours, a delicate dragonfly would emerge and fly away. The blue water, rocky shorelines, and green vegetation made for beautiful scenery. The weather was nice. No jackets were needed and there was only one rainstorm. It was a grand adventure.